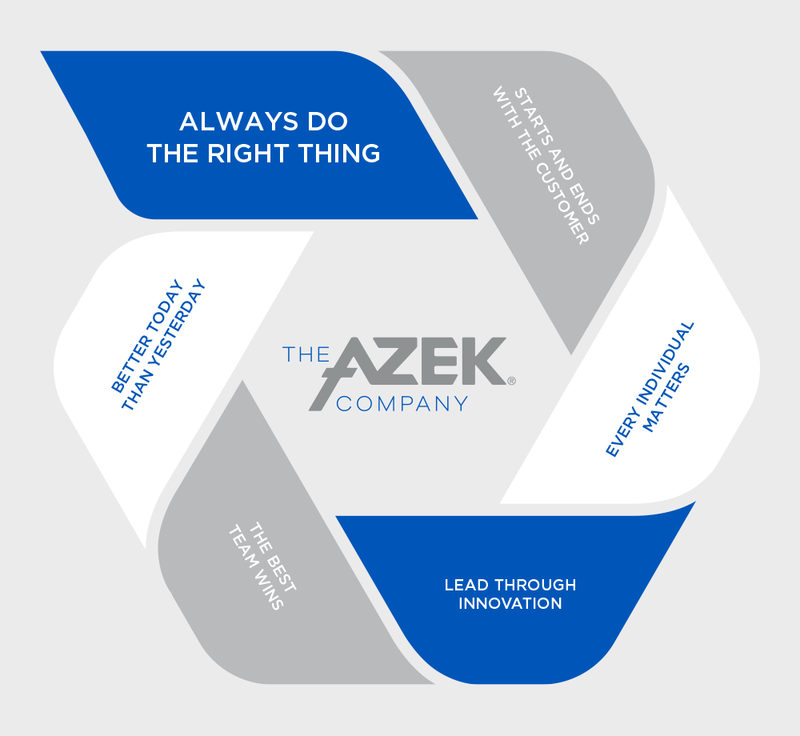 The AZEK® Company’s universal statement expresses what we do. Our values serve as a belief system that guides how we work. Our values influence our decisions, our interactions with colleagues and customers, and our standards for behavior. We make tough decisions according to what is right, not by what is cheapest, fastest or easiest. When no formal policy exists, we do what we believe is best for our customers, our communities, our shareholders and our employees. We never compromise our ethics or our commitment to safety. We operate with integrity, transparency and courage. For every action we take, every decision we make, we ask ourselves, how will this affect our customers’ experience? It is our responsibility to understand their expectations, then surpass them. We deliver a premium experience that matches our high-quality products. We strive to truly understand our employees’ everyday realities and empathize with their challenges and aspirations. We seek out ideas from others who think differently than we do. We hire, retain and train the best talent. We believe everyone deserves respect, growth opportunities and a safe work environment. We always look out for each other. We are on the leading edge of the market because we ask, “What’s next?” We challenge ourselves to bring unique and high-tech products to market every year. We invest in the art of the possible and create new solutions to address needs customers don’t yet know they have. Our goal is to win, period. We hire and develop the most talented individuals and bring them together in pursuit of a shared goal. Our objectives give us a common definition of winning to hold ourselves accountable for outstanding results. For everything we do, we ask, “How can we do this better?” We are never satisfied with good enough. Data and digital insights help us work smarter, leaner, and faster with improved service and lower costs. We do this through AIMS (AZEK Integrated Management System), our continuous improvement methodology.